This particular yarn is Soie Naturelle 3-ply — 100% noil silk. It’s very nice yarn, slightly off-white with a hint of texture. This size gave me 22 wraps per inch, or 11 ends per inch, so my mini 31 x 31 loom (slightly smaller than a Weave-It) was required. (The 4-ply Soie Naturelle is a more Weave-It appropriate choice . It’s available in three weight choices, but here’s a link to the 16 ounce cone.) I’m really happy with Catnip Yarns‘ service and yarn choices. Add hot water, soap, and agitation. 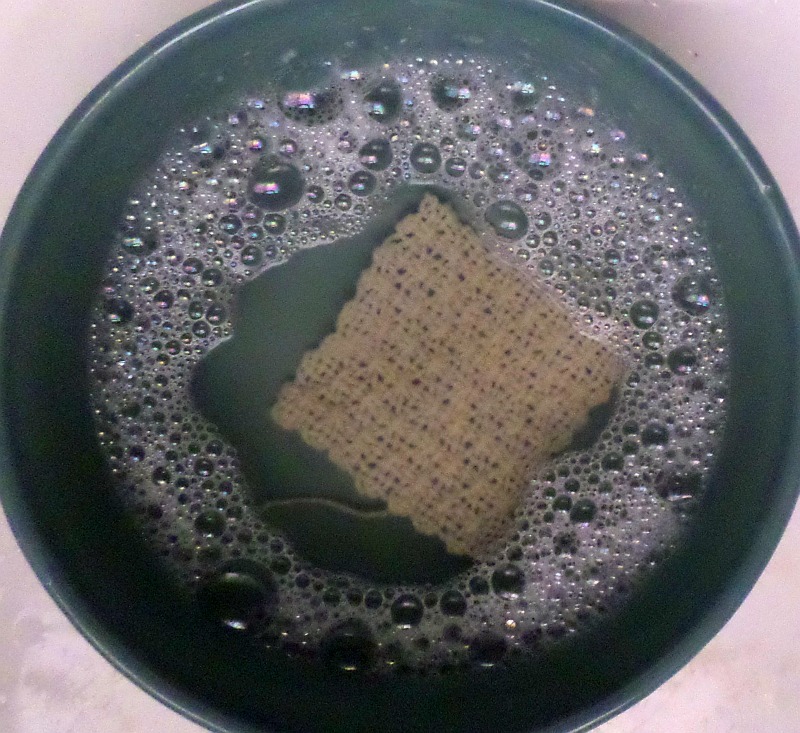 I rinsed it in cold water to make sure the piece would have a true washing machine-like experience. Soaked for a really long time because I got busy, but 15-30 minutes should have been sufficient. Removed from water, squeezed-not-wrung, rolled in a towel, stepped on towel to remove excess moisture, put outside in desert atmosphere to dry. Shrunken square is shown on top of unshrunken square. As you can see, the weave tightened up via the shrinkage. In this case, that’s a desirable quality—the pattern shows up better. And the yarn feels softer now—also desirable. I’m sure there’s a way to figure out the percentage of shrinkage that went on here—I’ll have my husband help me with that. I’m planning a rigid heddle loom project with this yarn, so these samples will help me determine how much extra length and width I’ll need when I warp up. (To tell the truth, I’ll probably warp up the full width no matter what, but I’ll make sure to add x% extra warp length.) To be a really High Achiever, I should probably warp up a larger pin loom and make another pair of samples to see if I accurately estimated my shrinkage percentages. Yeah, not happening. Just wanted you to know, pin looms make nifty quick sampler looms. Please see Judie’s comment below for more expert commentary about shrinkage. Thanks, Judie! Thanks Sue. Very interesting to see such a difference after washing. I don’t think it makes such a striking difference with acrylic and other synthetics, but the natural fibers change dramatically. 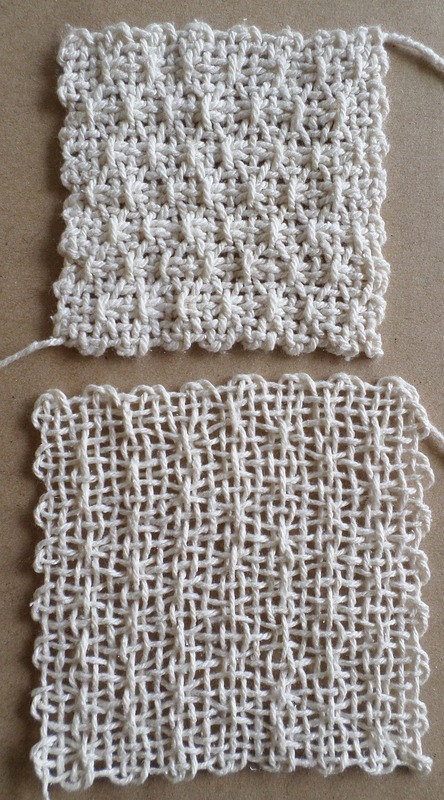 Shrinkage is an interesting topic in handweaving. With pin looms it becomes even more interesting. ‘Shrinkage’ can be caused by different reasons. One is the yarn itself may shrink. Another is the weave structure may collapse. Shrinkage is dependent on sett with any particular weave structure. 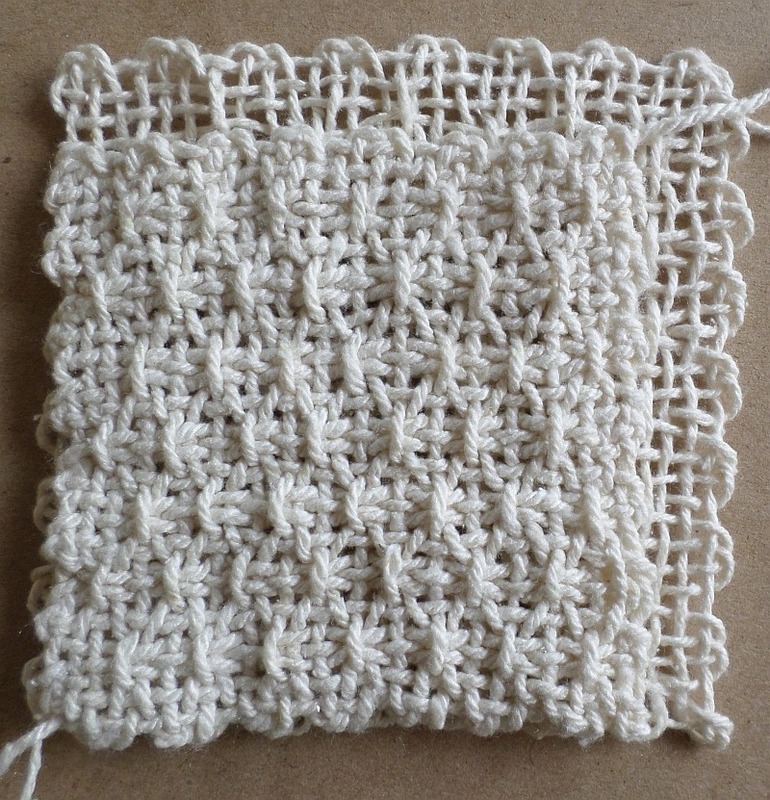 For example, using the same yarn in all samples, I can do plain weave at 20 epi, 24 epi, and 28 epi. After finishing the samples will be different sizes. The 28 epi will shrink the least and the 20 epi the most. What this means is that the samples only predict the ‘shrinkage’ for both yarn, sett and weave structure. And that is really what you want to know anyway. In industry, you would have the yarn created to exact specs and samples that exactly predict your results. For hand weavers, we have to start with what we have. Which says your samples are indeed the way to go for a project. Thank you Judie! Your knowledgeable commentary is always appreciated. Wow Mae! Thank you for these wonderfully kind words. If you’re on Facebook consider joining the Pin Loom Weaving Support Group. We have a lot of members who know a whole lot more about fiber stuff than I do.